Superior, CO 80027, Oriental Rug Cleaning. Two New Types of Rugs. Call 303-530-0646. For more articles like this, go to Cleancare Articles. The distinctive knotting technique used has a rod placed in front of the warp and a continuous yarn is looped around two warps and then once around the rod. When a row is completed, the rod is removed and the loops are cut to form the pile. See image above. So what’s new in Tibetan weaving? 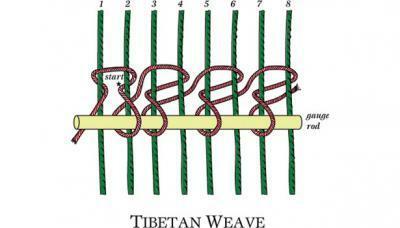 A few years ago, a new technique was developed for the Tibetan weave that cut time and cost. The method does not tie the knots as noted above, but just loops through the foundation. The warps, when exposed by removing the pile, appear to “float” or are “un-crossed”. The traditional foundation is woven over and under. The new style that is coming in for cleaning today is hand-loomed rugs from India. Pottery Barn and others are selling them. From a distance, it appears they are hand-knotted, but on closer inspection it is clear some other method is being used. Grin the pile and you can see the weaving technique (Image 7) and pull the rug side-to-side looking at the back (Image 8). The foundation is not the same as a hand-knotted rug. These rugs are woven on a loom that seems like a primitive Wilton loom (Image 9). It uses a rod like a Wire Wilton loom to give pile height and create cut or loop pile. A blade at the end of the wire cuts the pile as it is removed. A wire without the blade would result in a looped pile rug. In terms of cleaning concerns, dyes are pH sensitive (cleaning or spotting products can cause color change) and the rug doesn’t have good dimensional stability. When it gets wet, it’s even more susceptible to being stretched during handling or possibly splitting. Some fringes are glued on so we look for this during the Cleancare pre-cleaning inspection. Also, rolling a desk chair across it will cause the “rows” to separate and this rug must be carefully vacuumed (never use a brush roller/beater bar) or groomed, as the tufts will pull out pretty easily. And finally, the cheaper construction makes cut downs (reducing in size) and re-weaves more difficult. If you have recently bought a rug of this type, keep it out of high traffic areas. You don't want to clean it often. When you do, however, Cleancare is always here for your fine rug washing needs. Expert cleaning with superior equipment serving Boulder County and surrounding areas.